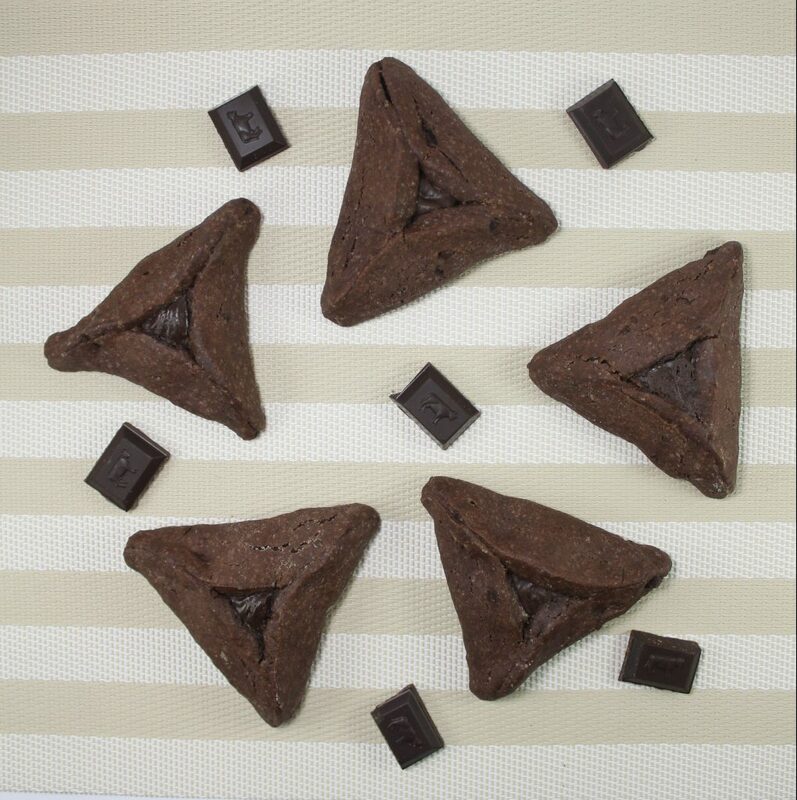 Triple Chocolate Hamantaschen - No Way That's Healthy! Chocolate on chocolate on chocolate, what’s not to like? This dough is a cross between a chocolate cookie and a brownie. The chopped chocolate added to the dough adds even more chocolaty goodness. And of course, this is super simple to mix together, no creaming margarine here! If you try any of my recipes please be sure to tag me @nowaythatshealthy and/or comment below! I’d love to hear from you! Preheat oven to 350˚F. Line a baking sheet with baking paper. Whisk the oil, sugar and vanilla. Add in the eggs and whisk till combined. Whisk in the cocoa powder, being sure to remove any lumps. Add in the flour, salt and baking soda. Mix together using a spoon. The dough should easily come together into a ball. It may require more flour, but be sure you do not add too much. You want it slightly sticky to ensure the edges stay closed. Lightly flour the surface you will be rolling the dough out on. Roll out the dough to ¼-½ an inch thickness. Sprinkle the finely chopped chocolate all over the dough. Roll the rolling pin over the dough once to push the chocolate into the dough. Use the rim of a glass cup or round cookie cutter to cut rounds of the dough. Place onto the baking sheet then place two teaspoons of chocolate spread in the center of the circle. Pinch together the top and then bottom two corners creating a triangular shape. I do not suggest that you refrigerate this dough. It takes seconds to put together making it simple to prepare right before you need it. It can sit out room temperature for a bit as well until you use it. I was skeptical about the use of oil in place or butter or margarine, but wow! it really worked out well. This recipe was so easy to follow and great fun to make with my seven year old daughter. Nice to be able to skip chilling time. The dough was great to work with, and the extra bit of moisture made it so that my daughter could easily pinch the cookies on her own. Definitely a keeper. Thanks!